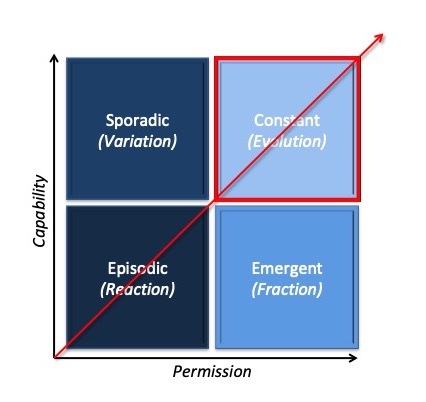 If organizations are going to remain relevant, they need to evolve from a time when change was episodic, sporadic or emergent and to a place where it is constant. This is shown in the Evolution Model below. This is achieved through giving everyone in the organization the capability and permission to be self-organizing so that change is constant, evolving, and cumulative. Regular readers of my posts will know that I often use a soccer analogy as explanation. The soccer teams at the top of their game have players who are given both the capability and permission to drive change. Many would claim that players like Cristiano Ronaldo and Lionel Messi have not just improved soccer but have changed it. They have evolved in the face of constant change. The rate of evolution in their goal scoring abilities should have taken decades or centuries based on past player performance. Through capability and permission, they have changed people’s expectations of what it means to be a great player. When change is episodic, organizations are inertial and change is infrequent, discontinuous, intermittent, and intentional. Change is driven top down. It is often a new programme of work or a change in strategic direction. By the time this form of change is delivered, the information about the environment, competition, consumer, customer, and emerging technologies that informed the decision to change are no longer relevant. The world has moved on. Episodic change is an occasional interruption or divergence from the equilibrium. It tends to be dramatic and driven by external events. Episodic change reflects the failure of the organization to adapt to a continually changing environment. If the people within the organization have little capability and permission to initiate and drive change, where and when it is needed, change will continue to be reactive to external events. If people do not have the permission to initiate and drive change, the capability to do so is worthless. We can’t have one without the other. When change is sporadic, it takes on a scattergun approach and change is not targeted where it is needed. We can equip everyone in the organization with the capability to identify, initiate, and drive change so that the organizations can thrive in the face of constant change. However, if everyone has to ask for permission, the rate of change will happen at irregular intervals in time and in isolated instances. Change will be non-continuous and infrequent. Without the capability to identify and drive change, giving people permission to do so is pointless. Giving people permission to lead change but not enabling them to do so, will result in a frustrated and disengaged workforce. Emergent change addresses the need to be responsive and adaptive. Change is constant but without the change capability it will be a fraction of something bigger. It will be messy and inefficient. If an organization is to thrive in the face of constant change, it needs energy and ideas from the whole of the organization. Everyone, at every level in the organization, must be in the business of leading and driving change. The competitive advantage lays in the ability to constantly change in order to meet the demands of an ever-evolving market, competition, customer and consumer demands, and emerging technology. Everyone in the organization needs to be equipped with the capability and permission to identify, initiate, and drive change. It is only through constant evolution that organizations will survive. As of April 2017, Toyota was the fifth largest company in the world in terms of revenue. Toyota has a culture of continuous change and improvement. Everyone in the organization, from executives to shop floor workers and production line workers, are given the capability and permission to drive change. When they see an opportunity, they can respond. They must be doing something right in a highly competitive and rapidly changing industry. Just as organizations have had to come to the realisation that change is constant and that they have to evolve to reflect the world in which they now live, soccer teams have had to do the same. Soccer has had to evolve over the years to deal with changes in the environment, skills of the opposition, and the type of competition. The rate of change has dramatically increased with advancing technologies, increased versatility of players, and the availability of instant information enabling fast decision-making. In this situation, change is not led and managed by the manager and coach alone. Everyone in the team (manager, coach, and players) identifies the need for change, initiates the change, and drives it forward. The ideas and energy in the face of constant change come from the entire team. In the meantime, please subscribe to my posts so you have no fear of missing out.